Geometric Measure Theory, Fourth Edition, is an excellent text for introducing ideas from geometric measure theory and the calculus of variations to beginning graduate students and researchers. This updated edition contains abundant illustrations, examples, exercises, and solutions; and the latest results on soap bubble clusters, including a new chapter on Double Bubbles in Spheres, Gauss Space, and Tori. It also includes a new chapter on Manifolds with Density and Perelman's Proof of the Poincaré Conjecture. 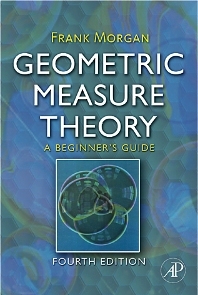 This text is essential to any student who wants to learn geometric measure theory, and will appeal to researchers and mathematicians working in the field. Morgan emphasizes geometry over proofs and technicalities providing a fast and efficient insight into many aspects of the subject. Abundant illustrations, examples, exercises, and solutions. The latest results on soap bubble clusters, including a new chapter on "Double Bubbles in Spheres, Gauss Space, and Tori." A new chapter on "Manifolds with Density and Perelman's Proof of the Poincaré Conjecture."